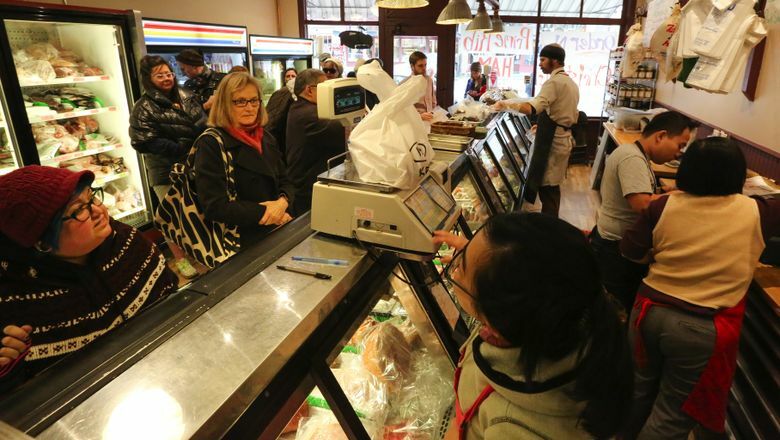 The celebrated butcher shop, Bob’s Quality Meats, has reopened after closing in July when a roof fire melted the ceiling and floors and forced customers to buy holiday meals elsewhere. Bob’s Quality Meats was nearly empty, a new frozen-meat case without its steaks and honey-glazed hams. It was three weeks before Christmas, a make-or-break season for the Columbia City butcher shop, and employees were scrambling to get the store ready for the holidays. “We have this need to open as soon as possible,” owner James Ackley said as his son, Abraham, cleaned the cooler at the front of the small shop. 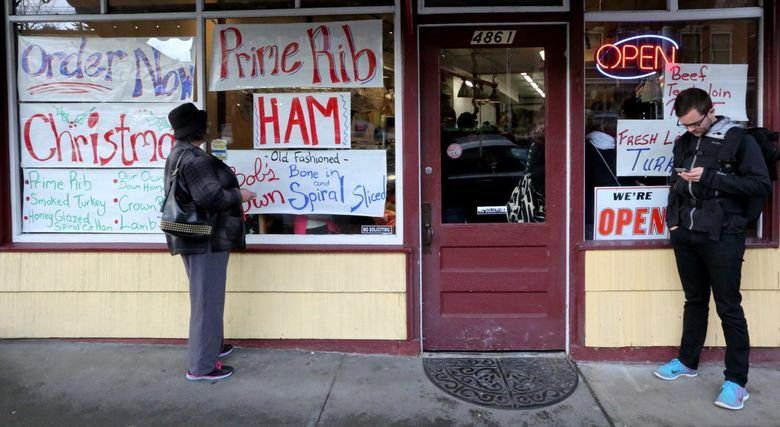 Families across Seattle have been buying Bob’s meats for decades, and after a roof fire closed the family-owned business in July, the pressure to reopen and fill Christmas orders was intense. The store at 4861 Rainier Ave. S. started taking orders again earlier this month, though with a slightly modified menu. Last-minute building preparations cut time for smoking some of the store’s big meats, such as its popular fresh turkeys and hams. “I don’t think that many people get the opportunity to experience this kind of connection … with their neighborhood, particularly in an urban place that we in our family have always kind of known,” said Abraham Ackley, the shop’s current manager. He was delivering orders July 2, a busy day before the Fourth of July, when a refrigerator compressor malfunctioned on the shop’s roof, sparking a two-alarm fire that melted the ceiling and walls. He arrived back at the store to find the road blocked and the fire roaring. Because of the building’s location, and because it has not undergone significant change since it opened as a butcher shop more than 100 years ago, the building is considered historic, said Flo Lentz, a staff member for 4Culture, King County’s cultural-services agency. She leads the historic-preservation program. Pour ¾ cup of water or ¾ cup of beer in pan. Place on rack. Place turkey in roasting pan and cover with lid. Put in oven. Warm one hour. 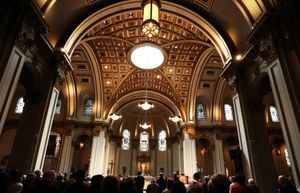 And because of that status, the Ackleys qualified to receive a $200,000 grant to help cover repair costs through 4Culture’s Saving Landmarks program. The building overhaul from roof to floor cost $400,000 to $500,000, James Ackley said. The six-month closure and stress from remodeling challenged the business, he said. But the headaches were never enough to consider a permanent closure. Place ham, foil wrapped to a pan, in oven. Heat ham 10 to 15 minutes per pound. Refrigerate up to 6-8 days. Freeze for about 6 weeks. Thaw 24 hours in the refrigerator before heating. His customers, he said, make the job worthwhile. This fall, they rallied behind the re-construction project and signed a petition for the Ackleys to include in their application for the Saving Landmarks grant. A review panel recommended that the meat shop and two other places receive money. For families who have been buying Bob’s Thanksgivings turkeys for generations, the closure over the holiday was rough. 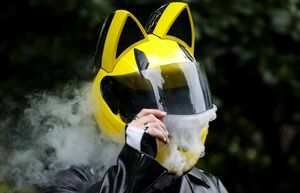 After noticing some outcry, James Ackley took preorders and smoked about one-fourth of his usual amount, which customers picked up at his wife’s Hillman City business. For customer Holtzen, the December opening comes just in time to maintain his family’s holiday tradition: Bob’s pork pan-sausage sandwiches for breakfast. He said that over the years he’s gotten to know the Ackleys well — they’re known for telling stories, he said. During the temporary closure, it felt like there was a “hole” in Columbia City. As customers celebrate the chance to buy the store’s popular meat bundles and delicatessen-style sides again, employees are celebrating for a different reason: the chance to be back selling behind the meat counter. “I think you could probably put an army back here [before] Christmas and you could probably have your hands full,” Abraham Ackley said.